This is a wholesome and terrific side dish for any type of entree. This pasta would also make a wonderful main dish, just double the recipe. Roast extra vegetables and save them for another meal. Remove the fine papery outer part of the garlic leaving the rest of the skin attached. Cut 1/4-inch off the top of the garlic bulb. Rub 1/2 tablespoon of the oil on the outer part of the garlic, onion and bell peppers. Place the vegetables on a baking sheet and roast for 1 hour. Remove the skin, seeds and membrane from the bell pepper. When cool enough to handle, squeeze the garlic out of the bulb. Slice the onion and bell pepper into 1/4 inch slices. 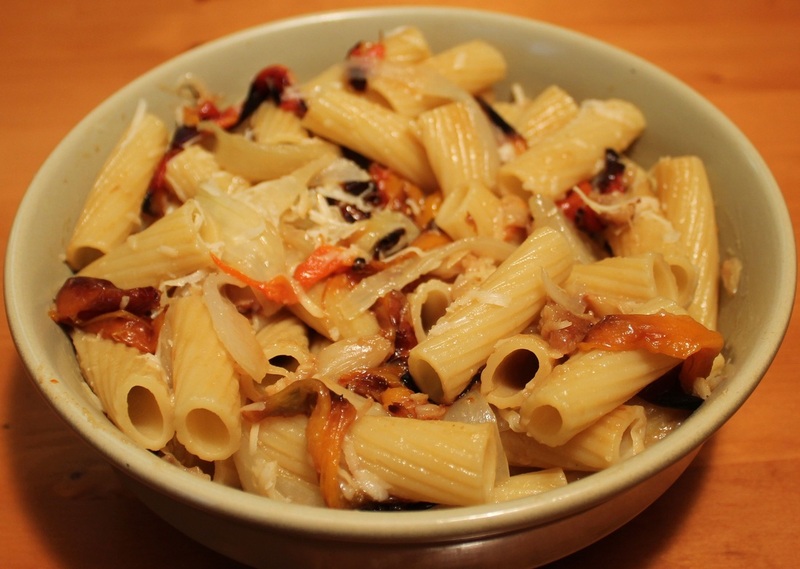 Drain when done, put pasta into a bowl, stir in the olive oil and the roasted vegetables.